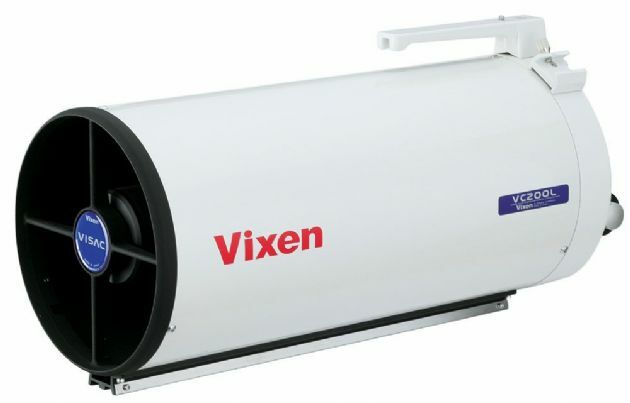 The Vixen VC200L is a 200mm f9.0 well-corrected, specialised telescope for astro imaging. Vixen's unique catadioptric design features a high precision sixth order aspherical primary mirror, a convex secondary mirror and triplet corrector lens. The primary mirror is held by a retaining ring, instead of hooks, to decrease flare and enhance contrast. The VISAC (Vixen Sixth-Order Aspherical Cassegrain) design provides high-definition star images to the edge of a wide viewing field and offers excellent performance for astrophotography. Even at the edge of 35mm film format CCD chips, stars are sharp and typically above the resolution of high quality CCD imagers. This means that the telescope does not limit image quality. The optional f6.4 focal reducer allows for much shorter exposure times. The tube is supplied with 7x50 illuminated reticle finder scope, flip mirror and dovetail mounting rail (eyepieces sold seperately).